I decided to do a double feature and a double write up review for the simple fact both are starring the wonderful Jane Fonda who has starred in so many wonderful films. One of the great mystery thrillers 1971’s Klute which might I add won her an Oscar. Also, starred in some amazing drama’s in her career, the one and only 1977’s Julia which has also been a Twilight Tine Special Edition Blu-ray release. She has also been honored with many of her films as Special Edition Blu-ray’s by Twilight Time such as 9 to 5, Cat Ballou, Julia, and now these two. She also starred it the amazing 1979’s The China Syndrome. But it is the tear jerking all-time favorite of mine, 1981’s On Golden Pond where she starred with her father, the masterpiece performer Henry Fonda that will always stand out and get me. It was great seeing her once again in both parts, Ella Connors in Comes a Horseman and Iris King in Stanley & Iris. I have always loved this classic western romance. It’s a true drama that sticks out and has a little sentimental back drop for me. Growing up I was either in school, or at my Uncle Earl’s. My Uncle Earl bleed manly western cowboy. If he didn’t have a coffee in one hand and a Louis L'Amour book in the other, it was a western on TV. I always joked with him that he was a cowboy in the city. Trust me when I say he bleed basic ranch western life, in everything he did. He and I would go to Saturday Matinees of westerns playing on the big screen, and if it was Sunday it was all day westerns on TV. Now days that is rare, but when I was growing up, it was everywhere. One of those westerns, or sort of a modern western set in the 1940’s was 1978’s Comes a Horseman. I first saw this on an all-day theater marathon, where if you brought in a can food item for the poor, you got in at 50 cents. One step further if you dressed up, you got 25 cent popcorn. Anyways one of those midday flicks on the big screen was Comes a Horseman, and that is why I fondly remember it, sitting next to my Uncle Earl, God rest his soul, I miss him greatly, but he gave me lots of amazing memories. So, getting back to the review I was super doper happy to read on the press release that Twilight Time was binging this to Blu-ray. Now sadly this film did not age well, and was not taken care of on the original prints. Twilight Time has warned about the quality of the print. There is speckling and great debris at times. Sadly, it is very noticeable throughout, but I am still utterly thankful that they took the time and tried to save this film. It still is transferred to High Definition in the best way possible. I agree whole heartily that this is an important piece of cinema and should be expressed in whatever ability that it can be. Yes, the imagery is nothing as great as other Twilight Time releases, but I am thoroughly thankful and in total enjoyment to be able to experience this wonderful film. All one must do is look at the amazing one and kind cast this film has. The one and only James Caan, Jason Robards, Mark Harmon who need no introduction. Also, starring the extraordinary Macon McCalman who was an amazing character actor and performer. He never got the stardom or limelight I feel he deserved. I always could pinpoint him out no matter how small the role. He has been in many films in his career performing in over 100 performances in his long career. A character actor that shinned. He was in some of the great films in cinema history, the one and only 1972’s Deliverance, the brilliant comical and dramatic 1991’s Fried Green Tomatoes and others. He has been in many of my favorite guilty pleasures, a wonderful array of B-movies, Cult films, Drive-In style entertainment. If you know me or have read my reviews in the past you know I collect Cult and B-movies. He starred in the Cult greats like 1977’s Smoky and the Bandit, 1981’s The Incredible Shrinking Woman, 1981’s Dead & Buried, 1982’s Timerider, 1984’s Fleshburn. He also was a regular on TV series and TV movies. It was great seeing him in this again, I had forgotten he was in it. The whole cast play off each other. A wonderful acted story . It tells the story of two ranchers played wonderful by James Caan and Jane Fonda. There small operation is in trouble due to money woes and the expanding operation of a local land baron played wonderful by Jason Robards. Directed by the amazing and truly gifted visionary director, producer and writer that sadly we lost in 1998, Alan J. Pakula. He always had away with cinema in creating believable scenarios and memorable shots of the camera and focus on a certain moment in his films. He created such greats as All the President's Men (1976), Sophie’s Choice (1982), Presumed Innocent (1990) among many others. His gift showed and Comes a Horseman is that shinning gift in all its amazing moments from drama, to sensual. Comes a Horseman through the lens and hands of Alan J. Pakula crafted a memorable film. What is amazing about Alan J. Pakula he adapted many of his films he directed to screenplay. The book Sophie's Choice he wrote the screenplay for. He not only created his vision for the stories on screen, but he all so put his vision many times on paper in writing the screenplays. Sadly, during the filming of this movie, a stunt man named Jim Sheppard was killed during a horse stunt. Shepard was only 40 years old. He had worked as a stunt man and stunt double since 1960, started working in Audie Murphy films; stunt doubling for him. He stunt doubled for Audie Murphy in 10 of his movies. He also worked on the great sci-fi classic 1968’s The Planet of the Apes, and on the western masterpiece 1969’s The Wild Bunch. The cause of his death is the scene of the horse dragging Robards character, Shepard had stunt doubled this shot, the filmed death is not in the movie, but the stunt is still seen that caused the death. It’s always a sad and tragic reality when a person working on a film ends up losing their life. That is another reason this film should be remembered and cared for, a stunt man who believed in his craft, died, doing what he did best, and doing what he loved and so this movie should be held in high regards because of that. This was directed by a truly wonderful director that we lost in 1990, Martin Ritt, he was truly a gifted man. A playwright, an actor, but most of all a director is what he's remembered for. He mastered such greats as HUD, The Spy Who Came in from the Cold, The Great White Hope, Sounder, Norma Rae, among many priceless others. What’s interested is he directed the 1964 film The Outrage which is the American retelling of the classic masterpiece of Kurosawa's Rashomon. Sadly, that crazy house of un-American activities committee in the 1950's started looking at this wonderful director, and he became blacklisted by supporting supposedly the Communist Party. This was during a time that too many wonderful directors, actors, got that tag, and destroyed them because of the stupidity of these lynch mob type people. He was blacklisted from television, he was not able to do anything on television again because of that blacklisting, and so he returned to theater. Thankfully after the stupidity of the red scare movement in Hollywood which started to die down, he could direct again. When he started out his first directed movie was 1957's The Edge of the City which is an amazing film, and after that he would go on to direct many, many more, including this film Stanley & Iris. Now interesting is he directed 1976's The Front starring Woody Allen. This was the first feature film to talk about the blacklist. It was about how people would put their names on blacklisted writer’s screenplays so that the movies could be made. Also, starring the one and only master thespian Robert De Niro. De Niro is one of the greats of cinema history and really needs no introduction. Mastering so many amazing characters throughout his career. 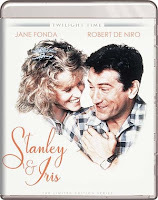 De Niro and Jane Fonda are excellent together in this romantic drama. The plot is simple and yet very touching and memorable. Iris King a woman who has lost her husband ends up meeting Stanley Cox after he helps her when her purse is snatched on a bus. Little did Iris know this chance meeting would lead to her falling in love with Stanley Cox who is a cook at a cafeteria. What Iris ends up discovering about Stanley is that he can’t read. Iris pin points this to Stanley’s boss, and sadly he is fired do to legal reasons and food safety, because of him not being able to properly read the products. After a long reality and life changing moments, Stanley ends up being taught to read by Iris. It’s a unique love story that touches the heart and makes you fall in love with the characters. Both films are amazingly captured on these two Blu-ray’s. 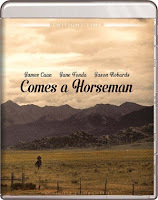 Comes a Horseman has its visual problems, but is the best transfer that’s available. Stanley & Iris looks amazing and is wonderful way to experience this film. Sadly, the critics hated this movie. It failed at the box office and was destroyed in reviews. I thought it was a fun movie. I loved both performances by De Niro and Fonda and always have, and could never understand why people hated it. My Rating: For Effort in trying to clean this up is all the rating it needs. Twilight Time did a great job in what they could, and for that, I praise them because this is an important piece of cinema. As mentioned above this has much debris and speckling, but compared to other viewing’s it looks great. Twilight Time did the best job they could to resurrect this forgotten and overlooked gem. It’s truly sad that this film was not taken care of, because the cinematography by Gordon Willis is stunning. A great transfer to 1080P High Definition. The sound quality is excellent. The imagery is crisp and vibrant. Another wonderful example of a Special Edition Blu-ray transfer that Twilight Time tends to do. In Comes a Horseman the picture is greatly laced with mishaps, but with Stanley & Iris it is the crystal clarity that you would expect from a Blu-ray by Twilight Time. Isolated Music Track (with some effects): The music is done by a truly wonderful musician. Michael Small was a talented musical genius. He died too soon, 64 years was too short for this master. He has composed some of the great music in films, such as, 1971’s Klute, 1975’s The Stepfords Wives, 1975’s Knight Movies, 1976’s Marathon Man, 1977’s Audrey Rose, 1977’s The Driver, 1986 Brighton Beach Memoirs, and many others. His gift to films and music is something to remember, and something that stands out. Twilight Time honored this man with this special feature. Isolated Music Track: Master John Williams does the soundtrack. He created his ultimate magic for countless films. His excellent style of thought provoking and intense music creates so many soundtracks, and in this soundtrack the musical score is no different. His style is one of a kind and really needs no write up. He is one of the best music composers and visionaries of sound that has ever graced the world of music and cinema. Earthquake, The Towering Inferno, Jaws, Star Wars A New Hope, Star Wars Empire Strikes Back, Star Wars Return of the Jedi, Close Encounters of the Third Kind, Superman, Raiders of the Lost Ark, Indiana Jones and the Temple of Doom, Indiana Jones and the Last Crusade, E.T., and I could go on and on, why bother, everything John Williams has ever done is a master talent. Pure brilliance. Pure mastery. John Williams is a true icon of cinema and music. Audio Commentary with Film Historians Julie Kirgo and Nick Redman. A wonderful listen by two amazing film lovers and true film historians. Priceless listen. Another wonderful trip into two films equally important. Comes a Horseman is a priceless western that shines and should always be respected. Sadly, it was never taken care of but thankfully Twilight Time took on the great task and did the best they could, and I am greatly thankful for that. Stanley & Iris is an often overlooked and underpraised little film with stunning acting, and a unique and touching film. Another great job by Twilight Time. Highly Recommended.